Sorry, it is ages since I posted here. Anyway, I have a couple of things that you might be interested in. I would like to feature some of your Christmas Products in a Handmade Christmas. More about this later but first, you need to know where this feature will be. Some of you may be familiar with a recent project I have been working on. For those of you that aren't aware, it is my pleasure to introduce Maboho! The Maboho scene is set around beauty & style for the 'average' Jo(anne). By 'average' I mean us everyday folks, who love beauty & fashion, regardless of age, size, shape and lifestyle. It brings together 'real' people with 'real' views, opinions and ideas by featuring review blogs/vlogs from hard-working and talented beauty and style bloggers. The platform will feature beauty & style products from both the High Street to the individualism of hand crafted products. The bias will be on small, independant businesses of course, but by sharing the same platform with more mainstream brands, it is hoped that it will raise the profile and general awareness of small businesses. There is a forum too. This forum is completely different to that of the Fresholi forum though, so not for technical/business discussion. What I would like to do with this is build a community where beauty & style focussed businesses/bloggers can interact and build nice relationships with those who would be consumers. Nice easy talk and relationship building for us mere 'average' beautiful people of the internet world ;) So if this is the sort of thing you think you could get involved in, do join us - It is only a baby as we are in the early stages at the moment but more we can grow the community, the more people you can reach out to, s0 please get involved, and spread the word so we can move this out of its infancy. If you have any products that you have had reviewed, particlarly by a beauty/style blogger and especially by vlogger, send me an email to enquiries@maboho.co.uk with a link to the review. I can then set about adding the review to the site (once I have the blogger's permission of course). If you are releasing a new line of products or have a presentation that you think may 'fit', just let me know. 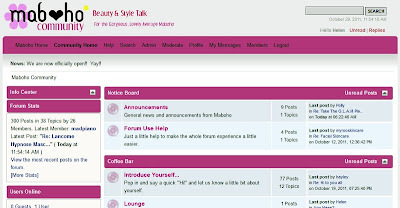 You can also add your business listing to the directory and tell anyone else, who have a beauty/style related business to add theirs. Follow Maboho tweets.... @Myboho and tell others. The wider the audience, the bigger exposure I can give to businesses (if you see what I mean). I am going to put together a feature called 'Handmade Christmas', which will feature a range of bath and body gift sets that have all been handmade. Do You Know Any Crafters/Designers Of Clothing/Accessories/Gifts? I would like to feature some gift ideas for hand crafted / uniquely designed clothing/accessories/gifts that would make ideal Christmas gifts. If there's anyone you are in contact with or who's work impresses you and they make some really stylish/unique clothing pieces/accessories and you think they should be featured, please point them to this blog post for the details, because I would rather feature someone known by a blog reader. - Links to any blog/vlog reviews if available. I will update reviews/product features at the @Myboho account on twitter (in case you don't already follow it). Gosh.... that turned out to be a much bigger post than expected. Sorry if I rambled. I am wishing everyone a lovely evening and I hope you have fun over Halloween!! !